We’d love your help. Let us know what’s wrong with this preview of Two Men and a Car by Michael Garland. He must make a speech to a joint session of Congress that will build support for America’s entry to World War II, but to do that he needs an armored vehicle in which to make the short trip from the White House to the Capitol Building. According to legend, the car Roosevelt rode in that day, borrowed from the FBI’s impound lot, was an armored Cadillac V-8 built for gangster He must make a speech to a joint session of Congress that will build support for America’s entry to World War II, but to do that he needs an armored vehicle in which to make the short trip from the White House to the Capitol Building. According to legend, the car Roosevelt rode in that day, borrowed from the FBI’s impound lot, was an armored Cadillac V-8 built for gangster Al Capone in the late 1920s to shield himself from enemies. Is the legend true, or is it an American tall tale in the tradition of Paul Bunyan or John Henry? Either way, it’s an ideal vehicle to compare and contrast the lives of two American men who grew up within miles of one another: one a great president, the other an infamous villain. To ask other readers questions about Two Men and a Car, please sign up. The bookcover hooked me in! Love the art work and the idea that Franklin D. Roosevelt and Al Capone may have had a connection with a Cadillac V-8. The perfect "vehicle" to help kids with compare/contrast. "This tale begins as a story about a car. Then it becomes a story about the lives of two men. And finally it becomes a story about America in the first half of the twentieth century. But it begins with a car." So begins this wonderful work of non-fiction by Michael Garland. There is debate about whether Franklin Roosevelt actually rode in Al Capone's custom built Cadillac V-8 after it was impounded by the government following Capone's conviction on tax evasion charges in 1931, but the car provid "This tale begins as a story about a car. Then it becomes a story about the lives of two men. And finally it becomes a story about America in the first half of the twentieth century. But it begins with a car." So begins this wonderful work of non-fiction by Michael Garland. 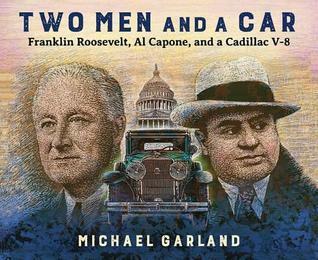 There is debate about whether Franklin Roosevelt actually rode in Al Capone's custom built Cadillac V-8 after it was impounded by the government following Capone's conviction on tax evasion charges in 1931, but the car provides the means for Garland to tell the story of these two very different men, which highlights traits that they had in common as well as their differences, which led to their very different life paths. In addition to the story, the illustrations in this book are just beautiful and a perfect complement to the story. Highly recommended. Intersecting parallel biographies of Al Capone and Theodore Roosevelt make for an interesting read. Back matter includes a timeline and additional resources.